Animal Assisted therapy (AAT) is nothing new, but the ways animals seem able to help people is growing. Back in 600 BC the Greeks noted the horse’s therapeutic value. Now horses are being used to help treat people with depression, autistic children and young people with behavioural problems. Dolphins were first used to treat depression and nervous disorders in the the former Soviet Union, but now Dolphin Assisted Therapy, or DAT is used for children with autism, learning disabilities, Cerebral Palsy and other conditions. Dogs are well known for their ability help blind, deaf, diabetic and epileptic owners, and more recently dementia patients. Therapeutic Pets of Canada (TPOC) and Therapet in the US use dogs to help relieve stress in people. Research has shown that dogs can not only reduce stress, lower heart rate and blood pressure (Katcher, Friedmann, Beck, & Lynch, 1983), but, as pet owners will attest, ease loneliness. 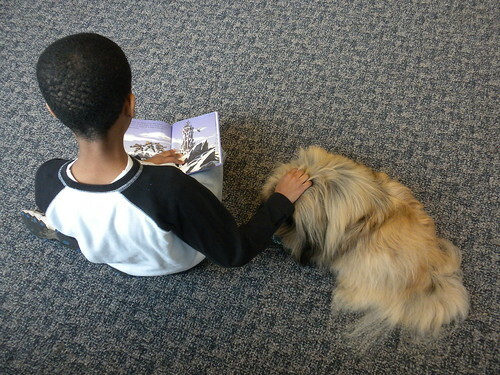 Dogs are now also becoming popular as reading buddies in libraries and schools. Children read aloud to specially trained dogs. Free of criticism and judgement children show improved motivation to read and reading skills, increased self-confidence and self-esteem, increased library use and better school attendance. Meanwhile in Holland, Cliff the dog is helping detect cases of a hospital bug at the VU University Medical Center in Amsterdam.